Our annual essay contest is an opportunity for participants to celebrate their BEAUTY and for us to celebrate them by featuring the winners in next year’s I AM BEAUTY calendar. The contest is open to girls and young women 10-21 years of age. Applicants must be able to participate in the B.E.A.U.T.Y. Day and Photoshoot on October 20, 2019 from 10am to 6pm at Toddlewood Studios in Baldwin , NY. Essay or Video Option - Submit a 500-1000 word essay or 1-2 minute video on what is your definition of BEAUTY and why you are B.E.A.U.T.Y ( Beautiful, Extraordinary, Ambitious , Unlimited , Talented , Young). 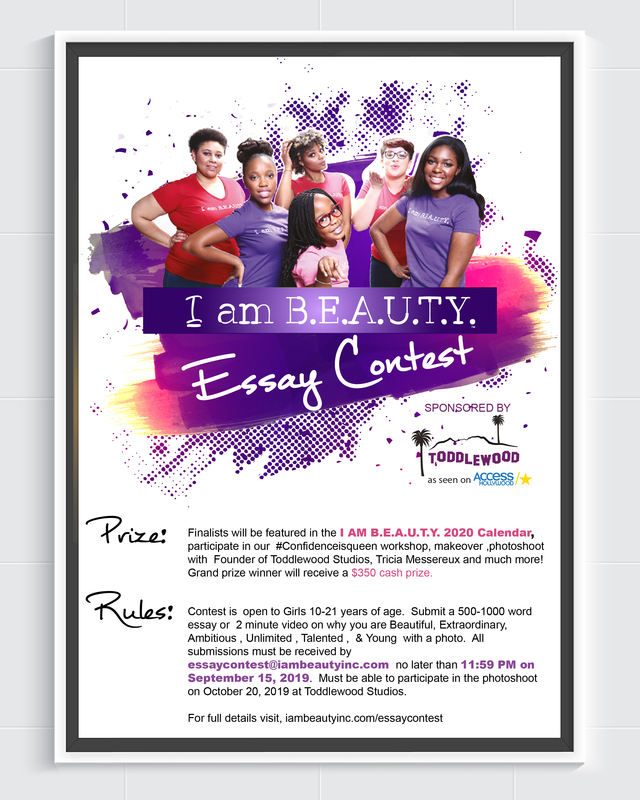 Email essaycontest@iambeautyinc.com by the Deadline - All submissions must be received by 11:59 PM on September 15, 2019. If you are submitting a video , please upload the video to youtube or vimeo and email the link to the address noted with a transcript of the video. Additional Information- Essays and videos should be submitted with a photo in jpeg format. Include applicant’s full name , age, school or college, , parent/guardian name and phone number in the body of the email. Notifications - Winners will be notified by email by October 1st. Make-up Application Tutorial and Makeover with team of professional makeup artists and hair stylists. Grand prize winner will receive a $350 cash prize. Now what are you waiting for ? Apply NOW!